May have already been posted. Silver says, matter of factly, that he is going to build the guest house. I encourage people to go to Joel's movies so he can continue working on Auldbrass. There have been some spectacular restorations in the past 30 or so years, but none of the buildings restored started out in such a derelict condition as Auldbrass. What Joel has done is truly spectacular. And so too, Storer. The condition of Storer when Joel bought it was not as far gone as Auldbrass, but it was not good. A previous owner (an artist!) had painted the interior blocks blue on the first floor and yellow in the living room (or the other way around, I don't recall, but it burned the retinas). The owner following her dug up the ground floor with the intention of building a basement under the house for his primal scream therapy sessions. When that fell through, a blank slab was poured where the block floor had been. Instead, he built a plywood door to close off the living room from the stair hall. Joel's restoration was impeccable. as an ideal embodiment of the two-floor volume with exposure on its opposing elevations---a form one associates with industrial rather than domestic structures ? I suspect FLW included the plaster Lowes Project in Wendingen, because he didn't like the Storer block version. 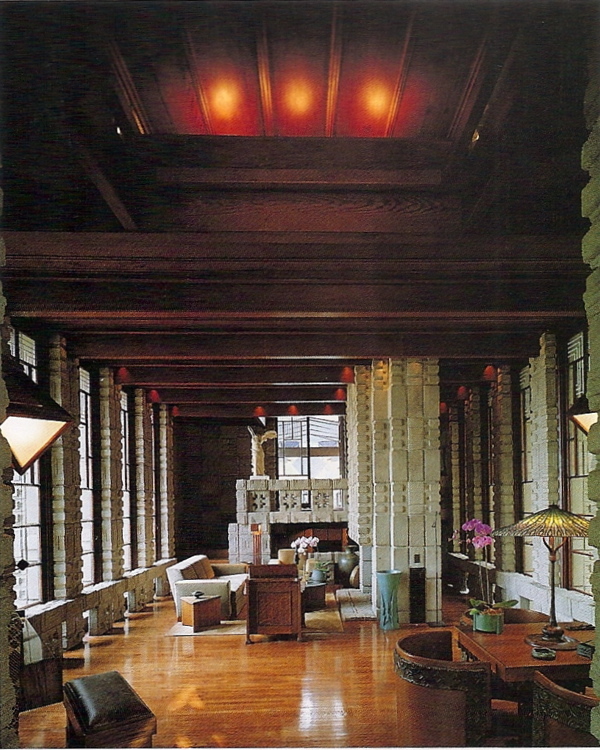 The FLW project preceded RMS's Lowes House. After Lowes turned down FLW's scheme, they turned to RMS, who had just left FLW's employment. Rudi designed an unusual variation on the first scheme, with a somewhat tortured circulation plan and some curious cubistic details. Unfortunately, there are few interior shots of the house. In the 50s, Lowes got in the way of progress, and was demolished to make way for a freeway. Long-time Gamble House Director, Randall Makinson, salvaged the hood over the living room fireplace, and years later, integrated it into a house he designed for himself. that surface patterns hardly matter---to me. aligned with the columns, with which the rail is engaged. 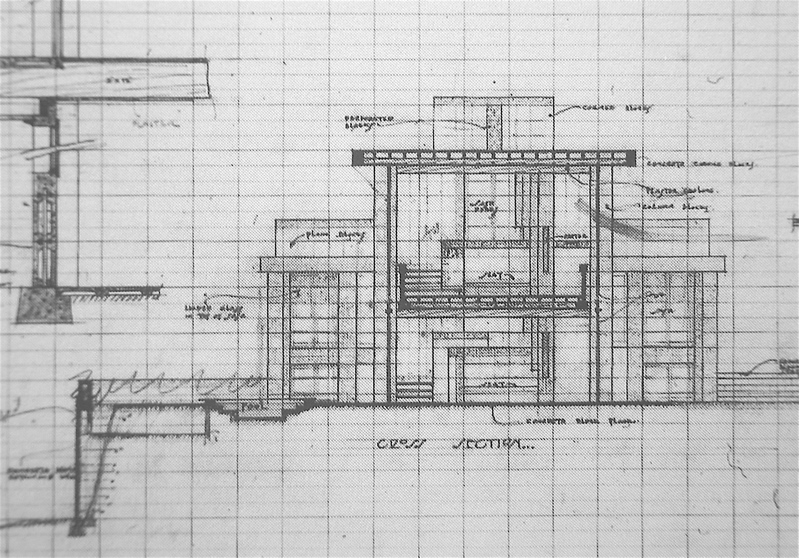 plans, elevations and sections . . . I agree that Storer is a magnificent house with a spectacular view from the living room. If I were to choose between it and the Lowes version, I would pick Storer. I imagine that FLW's beef with the house is its heaviness, which sets it apart from Millard, Ennis and especially Freeman. I'm puzzled by what appears in the photo above: no section drawing shows a portion of the roof rising above the rest, at the end of the house opposite the bedrooms . . .
Go to Google Maps, 3D. The center of the roof, from end to end, rises from a ceiling height of 8'0" to 10'8", extending 4' beyond over the access to the roof terraces at either end of the living room. In Taschen 2, page 113 it can be seen in the perspective, and in the construction photo on page 109, a glimpse of it shows. But you are correct, it does not show in the drawings. Oh; the photo on p 111 explains it, too. Wonder when that happened to the design. Pfeiffer is very generous with the images of this house---in the Monograph and in Taschen---but the Schulman photo of Joel Silver's Secessionist silver is odd. Don't tell me that's Wright's, too . . .